Brightline - ZineWiki - the history and culture of zines, independent media and the small press. 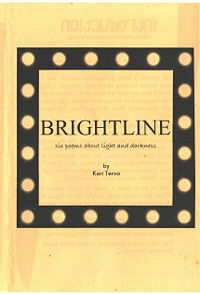 Brightline: Six Poems About Light and Darkness is a poetry zine written by Kari Tervo. It explores our inner light, as well as the evolution that occurs when we acknowledge our darkness. She writes about accepting the darkness of others, and protecting herself from it while being open to its lessons. The title, Brightline, is a legal term meaning, “Is it there, or is it not?” Here, it acknowledges the strength of the tiniest spark. This collection comes complete with an explanatory sentence for each poem. Quotations from famous people round out the message of each. Brightline is Tervo's first poetry zine. In July, 2015, John Berbrich of From the Marrow wrote about Brightline, "In these highly textured, tantalizingly compelling poems, Kari explores the depths of light & darkness in the personal intersection of humanity and the universe. She’s accepting, she’s curious, and she prefers to be positive, despite everything. These poems are accessible enough to invite you in and are complex enough to invite you back...a solid small collection." This page was last modified on 28 November 2015, at 17:12.